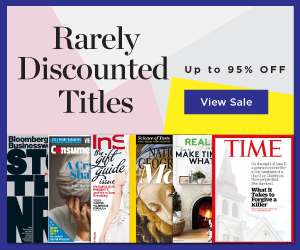 Home > Magazine Deals > Rare Magazine Discounts This Weekend – No Auto Renew! Rare Magazine Discounts This Weekend – No Auto Renew! This weekend get a rare deal on some of most loved magazines! To find discounts on National Geographic, Time, Consumer Reports and even Southern Living is a fun day. These are all 1-2 year subscriptions and do not auto renew. There are over 30 titles to choose from. Magazines make awesome gifts, plus they all take 4-8 weeks to get the first issue. That means ordering now they should start arriving right after Christmas. If you order for a gift select that option and you’ll get a printable card to give or they can even send a gift email for you. There is no special coupon needed. This sale ends Sunday night at midnight eastern time.